Sydney’s biggest CORPORATE GALA DINNER with Bollywood Beauty KARISMA KAPOOR. Witness beauty, fashion and glitz come together ! 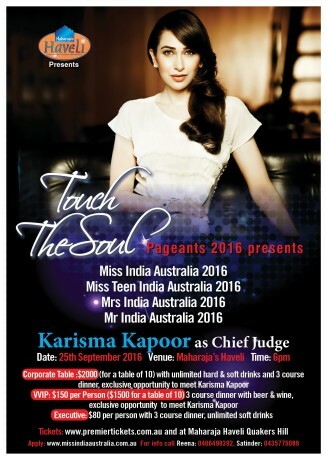 Miss India Australia Corporation or MIAC’s 2016 Touch The Soul beauty pageant is back again with another offering in 2016 carrying forward its legacy of Bollywood star judges and this year we have national award winning Bollywood actress ‘Karisma kAPOOR’ coming to enthral sydneysiders to be a chief judge for the beauty contest. Get set to witness Glamour, Style & Beauty all under one roof. Touch the Soul, a beauty pageant, truly celebrates womanhood by encouraging Australian women with Indian roots to embrace Indian culture and heritage. Touch the Soul provides an opportunity for ladies to make a difference and let their inner beauty shine. Our pageant has been created to celebrate the outstanding success a woman has achieved in different phases of life. As such Miss India Australia Corporation strives to recognise beautiful, successful, and confident and goal driven women. This glamorous and prestigious event provides a unique forum for empowering Indian men and women. On Door Tickets priced higher. Buy online with Premier Tickets & Save! MIAC’s Mrs/Miss/Mr India Australia “Touch the soul 2016″ contest is not merely about judging contestants on the basis of their awesome features and vital statistics. It is also about nurturing the individual, their hidden talents and the beauty of their personality. The participants are trained in various walks of life including voice, posture, fitness, language, pronunciation and more. The contest offers winners a huge exposure and a chance to meet, work and indulge with the best in fashion and grooming industry. “Touch the soul 2016″ is one sensational evening you surely want to get onto ! Premier Tickets offers you the chance to meet the beautiful Karisma Kapoor. The Corporate ticket for Touch the Soul 2016 entitles you to a face to face Meet & Greet with Bollywood actress Karisma Kapoor while they enjoy a 3 course dinner as part of the offer. The dinner will start at 8:30 pm with includes desserts. No Tickets required for kids below 5 years. Separate seating will not be provided to them. Premier Tickets is proud to be associated with Maharaja’s Haveli, our sponsor for the Mrs/Miss/Mr India Australia Touch the Soul event. Maharaja’s Haveli is a popular restaurant offering Indian flavour and delicacies to food lovers in Sydney amidst a cheerful and stylish atmosphere. Located at Quaker’s Hill Sydney the eatery offers its visitors a regal dining experience. Premier Tickets is Australia’s leading online event ticketing & marketing solution provider. We act as a channel between the event organisers and end customers helping our clients with hassle free event ticket booking, event marketing & promotion solutions. 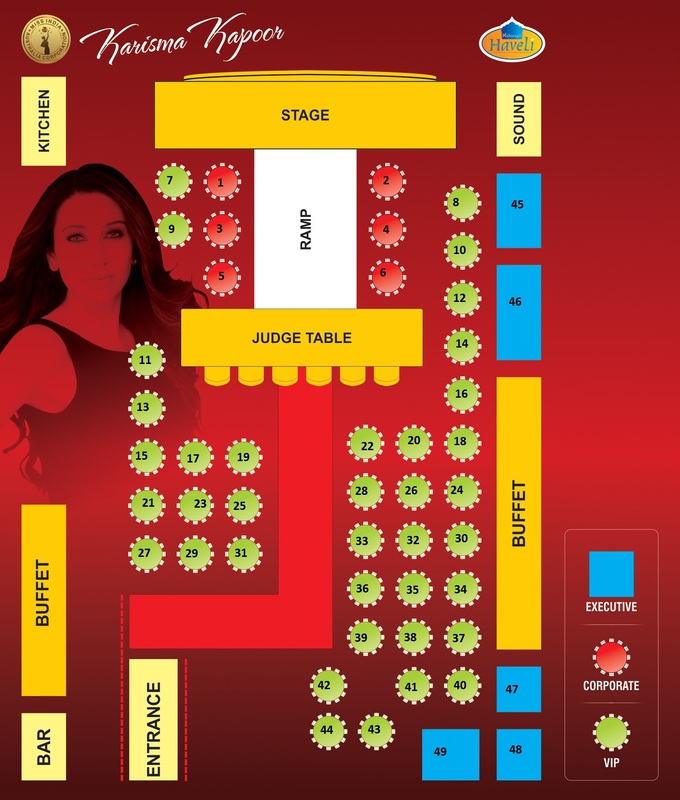 Contact us for any of your ticketing & marketing needs for the Miss/Mrs/Mr India Australia event.